Get your mum to help you melt the butter, sugar, syrup and cocoa in a saucepan. Then add the biscuits. Stir to combine, then mix in the Maltesers. Throw the raisin away. No one likes raisins in tiffin. Pour mixture into a 20-cm square tin and press down. Break up the chocolate and put the bits you haven`t eaten into a bowl. Put the bowl with the chocolate in it into a bigger bowl of hot (not boiling) water. Leave for ten minutes to melt. Stir sometimes. Then pour over the mixture. Put the tin into the fridge and leave for an hour to set. This quantity makes enough for one person. Do not share with siblings, parents or pets. 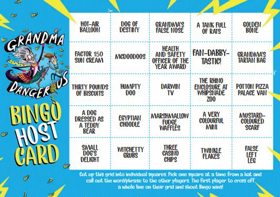 Host your own Granda Dangerous Bingo - cut up the "BINGO HOST CARD" into individual squares, and give the other bingo cards to the players. Pick one square at a time from a hat and call out the word or phrase to the other players. The first player to cross off a whole line on their grid and shout "BINGO!" wins!